Normally when you try to minimize your iTunes app, by default it will go to taskbar, sharing the space constraint taskbar with other running apps on your laptop or smaller screen netbook. If you would like the iTunes app to go directly to system tray whenever you click on minimize button, there is actually a setting in iTunes that you can enable. Just follow below steps and you will able to change its default minimizing location setting from taskbar to system tray. First, go and launch iTunes app. Then, go to ‘Edit’, follow by ‘Preferences’ or a shortcut key combination of Ctrl+,. 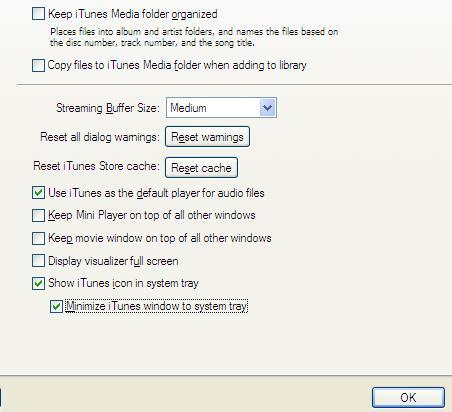 Next, browse to ‘Advanced’ tab, at the bottom-most, check on ‘Show iTunes icon in system tray’, followed by a check on ‘Minimize iTunes window to system tray’. Click on ‘OK’ and you are done. By now, whenever you try to minimize iTunes app and instead of going to your taskbar, it will go to system tray appear as a tiny icon. Clicking it again will bring the app up for use at any time. Hopefully these simple steps will able to free up some space in taskbar that will otherwise taking some unnecessary space on your tiny LCD screen.